I was pretty happy with my AFL round 10 2018 tips, mainly because it resulted in another winning bet. Now it’s time to see if I can improve on it with my AFL Round 11 2018 Tips. Speaking of tips, let’s have a look at my AFL Round 11 2018 Tips! Tips in hand it’s now time to see which of my favourite online sports betting sites are offering the best AFL odds for round 11 2018! Wow! Check out some of those longshot odds offered by Ladbrokes, especially the Carlton and St. Kilda games! As for my bet? I reckon I’m going to give Ladbrokes another go and try for a lucky hat trick! I’m not going for any straight out bet though. Nope. As you can see from the image there on the right Ladbrokes are offering top odds on the Sydney vs Carlton match. 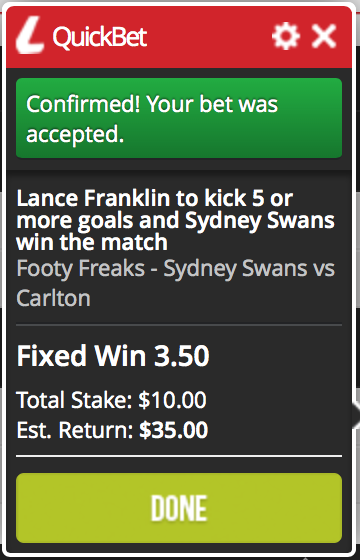 Specifically for Sydney to win and Buddy Franklins to kick 5+ goals. I couldn’t work out how to do it with the app, so I’ve visited their webpage. You can see proof of my bet here. That proof will also show that the odds offered by Ladbrokes on that particular bet are $3.50. Now, all I have to do is to enter the Million Dollar Tipping competition for this weeks chance of winning $10,00.